Fringed polygala (Polygala paucifolia) has creeping stems that grow partly under the soil and partly on top of the soil, with several shiny leaves at the top of each stem. The stems are less than six inches long, so the flowers grow very close to the ground. 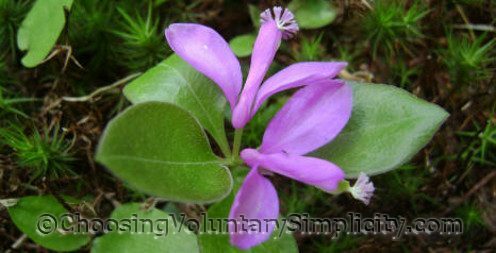 Polygala produces two types of flowers… unseen underground flowers that are self-pollinating and never open, and the pinkish-purple flowers that appear in May and June. These tiny flowers are only 3/4-inches long and remind me of miniature orchids. 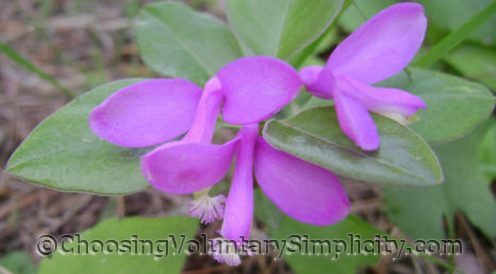 My grandmother always called them “baby toes,” and I have heard other people call them that too, but they are better known as fringed polygala, gaywings, flowering wintergreen (because their leaves look so much like wintergreen leaves) and fringed milkwort. This year there are several large patches of fringed polygala blossoming in the wooded area at the edge of our lawn. The soil is rich and moist there, and the polygala must like the growing conditions to have spread so quickly from the single fringed polygala that I transplanted in that spot only a few years ago. What an interesting little flower. It looks like a miniature orchid. 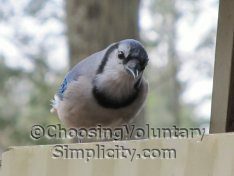 I sure would like to find some of these near our house. My mother called these babytoes too. She was French and often had different names for our common flowers. I haven’t seen these for years so I enjoyed your photographs. I managed to buy some starter plants from a local wildflower nursery and I’m happy to tell you that my starter plants are multiplying quite rapidly. They have spread into a bigger area and this year there were many flowers. They are pretty aren’t they? A lovely article and a beautiful plant. One I plan looking for in hopes of adding them to my garden.